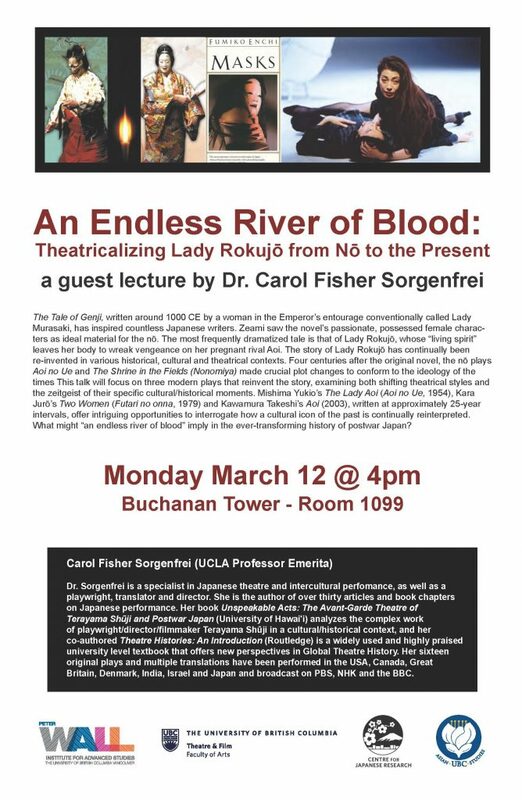 Guest Lecture by Dr. Carol Fisher Sorgenfrei. The Tale of Genji, written around 1000 CE by a woman in the Emperor’s entourage conventionally called Lady Murasaki, has inspired countless Japanese writers. Zeami saw the novel’s passionate, possessed female characters as ideal material for the nō. In the Sandō, he called these characters “jewels within jewels” whose stories contain “a seed that is full of grace yet is capable as well of providing a proper theatrical …atmosphere that is rarely met with.” (Rimer and Yamazaki, 153) The most frequently dramatized tale is that of Lady Rokujō, whose “living spirit” leaves her body to wreak vengeance on her pregnant rival Aoi. The story of Lady Rokujō has continually been re-invented in various historical, cultural and theatrical contexts. Four centuries after the original novel, the nō plays Aoi no Ue and The Shrine in the Fields (Nonomiya) made crucial plot changes to conform to the ideology of the times. The paper will focus on three modern plays that reinvent the story, examining both shifting theatrical styles and the zeitgeist of their specific cultural/historical moments. Mishima Yukio’s The Lady Aoi (Aoi no Ue, 1954), Kara Jurō’s Two Women (Futari no onna, 1979) and Kawamura Takeshi’s Aoi (2003), written at approximately 25-year intervals, offer intriguing opportunities to interrogate how a cultural icon of the past is continually reinterpreted. What might “an endless river of blood” imply in the ever-transforming history of postwar Japan?